I remember a candy bar commercial that left a lasting impact on me. In this commercial there is a man who is in dire need of a Kit-Kat Bar. He rushes to the local convenience store and see's that, to his great delight, there is only one more Kit-Kat Bar in the box, and it's all his. Once the man leaves the store the lady at the cashier pulls another Kit-Kat Bar out of a box full of Kit-Kat Bars, and another man rushes into the store feeling as lucky as the previous man felt. The lesson, I assumed, was that those who control the flow of supplies controls other peoples emotions. Diamonds are sold much in this same way, where diamond companies sit on thousands upon thousands of diamonds a year, releasing very few to the general public so that they can overcharge for their beautiful little stones. Despite the overflow of diamonds out there, many diamonds that are sold in stores are known as either conflict diamonds or blood diamonds, which are diamonds that were bought from terrorists or other people who cause great suffering to get the diamonds. 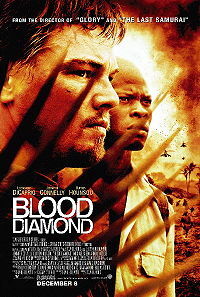 "Blood Diamond" takes place during a civil war in Sierra Leone, where a group of revolutionaries known as the RUF have just invaded a small village of families. There they raped the women, killed the men, and took the children with them to train them to be revolutionaries too. One man that is spared is Solomon Vandy (Djimon Hounsou), a fisherman who's family is taken to a special prison, and who's son is being trained to be the next general of the FUS. Solomon is forced to fish a river for diamond stones, where he finds the biggest diamond ever seen by man. Through a series of events that can only be classified as "way too close for comfort," Solomon buries the diamond but now has a living nuisance in the form of Danny Archer (Leonardo DiCaprio), a diamond smuggler who has heard about Solomon's diamond, and now wants it for himself. Solomon wants nothing more then to save his family but lacks the connections to save them. Danny has the connections to save Solomon's family, but only see's the effort worthwhile if Solomon will lead him to the place where the diamond is buried. Solomon goes along with Danny but both men are joined by Maddy Bowen (Jennifer Connelly), a frustrated journalist who wants to inspire change but doesn't know where to start. She figures if she can learn about how diamonds are smuggled she can take a good first step, which is why she is particularly interested in Danny's form of work. As for the FUS...well, they cause the most trouble. In almost every scene they are in the FUS shoot guns and kill as many people as possible, in action sequences that contain blood adrenaline thrills while still containing much human tragedy. Most action movies about tough material skates a fine line between filming fast paced action sequences while trying not to exploit a terrible situation. In most movies the human feelings are besides the point. 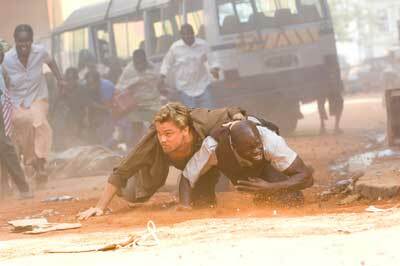 In "Blood Diamond" though the story is much closer to home then most action movies will go, and therefore it would be suicide if movie tried to ignore the human dilemma in the situations. 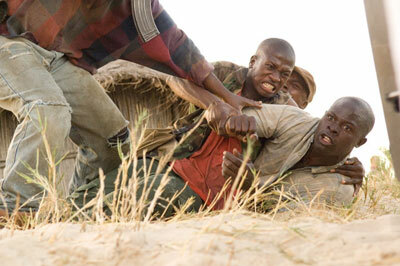 The movie doesn't ignore the human emotions though, which leads for a more fulfilling action movie then you usually see. Also worth noting is the excellent acting. Leonardo DiCaprio shows that he's come a long way since he made "Romeo & Juliet" and "The Beach." Sporting a very convincing Australian accent, DiCaprio not only sounds like a native from Africa, but his accent is consistent. He manages to go through many different emotions and feelings without ever breaking character. This is worth noting. It's also worth noting that DiCaprio's performance is really the only performance there is to critique in the first place. All the actors are so convincing in this movie that I forgot anyone was even acting in the first place. The only reason I knew DiCaprio was acting is because his accent is present. Otherwise though, the acting is so solid there's almost nothing to say about it. If there was a weak point to the acting, I would have to say it was Jennifer Connelly's performance as Maddy. While Connelly doesn't do a horrible acting job for this part, the character itself feels a little artificial. Yes, the beautiful reporter falls in love with DiCaprio's character, but admist all the chaos in this movie, I can't exactly pinpoint exactly where they would really have time to fall in love with each other. The first time the two have a serious conversation about anything, Danny tells her about his childhood and how his parents died. We see sympathy in her eyes, but anyone would fell this way after hearing a story about how ones parents died. This does not equal romance, but the director runs with it anyway, probably knowing that if he didn't run with it the romance would seem extremely false and fake. The movie ends with a warning to people who buy diamonds to make sure that the diamonds you buy are not conflict diamonds. I wonder how the consumer is supposed to know what constitutes for a conflict diamond and what doesn't, but I guess my job isn't to laminate on that too much in this review. I don't even want to laminate on the politics of this film too much as I don't think they add up to much in the end. What I want to laminate on is the excellent acting, spectacular action sequences, and heartbreaking ending. Hey, I AM watching a movie as opposed to a documentary! I think laminating on these things is worth doing after you see a good movie. 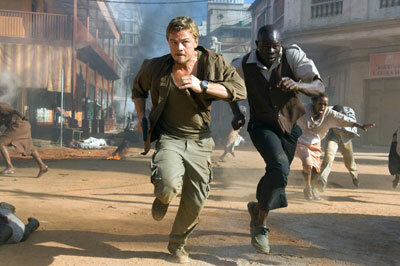 And "Blood Diamond" is a great movie. Parents will want to keep this movie away from children. There is extreme violence and language. Recommended for ages 17 and up.